HANOI (VNS) —Journalists from HCM City Television (HTV) won both individual and team events at a Chinese chess tournament held yesterday at Viet Nam News Agency's Southern Region Representative Office. In the individual category, Trinh Quoc Trong Nghia, from HTV won the first prize. Pham Manh Hung, of the Radio and Television Broadcasting College II and Pham Thanh Hung, from Binh Duong Province Television, secured second and third prizes, respectively. In team class, HTV won the first prize. 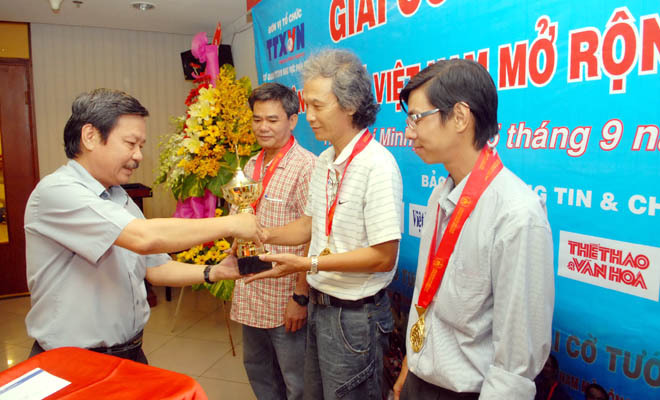 Binh Duong Province Television and Sai Gon Giai Phong newspaper's Chinese version, were runners-up. The fourth annual chess competition, held to mark the 69th anniversary of Viet Nam News Agency, attracted 80 journalists from 16 news agencies, television stations, newspapers in HCM City and neighbouring provinces.